To those of us who are dog lovers, our pets are one of the most important things to us. When a pet is also a therapy dog to someone, that bond is stronger and even more special. 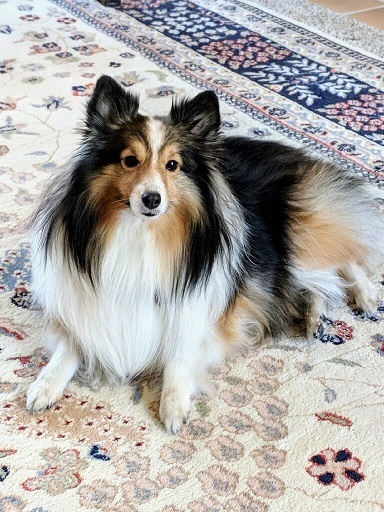 Tessa, a beautiful, 5-year-old female Sheltie has always been small for her breed, compared to her Sheltie brother and sister. But, Tessa has been a strong sense of comfort for her owner Patty Fairchild. Patty, a long-time trainer of animals in film and animal rescuer, has had her share of health issues. She has spent many weeks and months during the past three years in and out of the hospital. Tessa, from the time she was young, has been Patty’s service/therapy dog. Tessa’s quiet, sweet, patient nature has made her an excellent candidate for this job. Tessa is quite well known among the staff at St. Rose’s hospital in Las Vegas, Nevada; always keeping a watchful vigil over her master during her hospital stays. She is adept at alerting the doctors and nurses if her master is in distress. Tessa has become something of a canine hero for Patty. Several years ago, while hospitalized, Patty started going into medical distress (coding) and Tessa ran to get help, tugging on the doctor’s scrubs to get them to the room. She has also alerted Patty’s husband Richard at home when Patty stopped breathing. But sometimes a hero, even a canine one, needs a helping hand. Dear Tessa has been diagnosed with a severe case of bladder stones. She is having difficulty urinating and passing blood when she does. According to Dr. Terry Muratore at Legacy Animal Hospital in Las Vegas, surgery was needed. The cost would be up to $2,000.00. This has created a financial hardship for Patty and Richard as they are surviving on a single income which is often unsteady. Patty cannot lose Tessa. Please donate to the fundraiser to get the necessary money needed for the surgery. Donations can also be called in directly to Legacy Animal Hospital at 702-263-9004. Tessa has always stood by Patty with unconditional loyalty. Now we need to standby Tessa and help her get well so she can continue to be a service/therapy dog. The bond you have with your dog is as strong and everlasting as any of the other ties you will have on this earth. 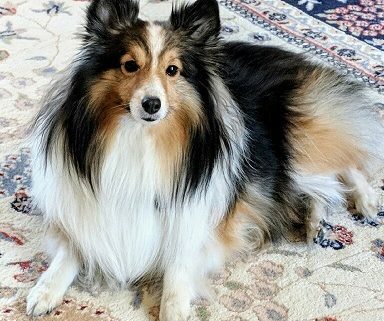 Please help Tess get the surgery she needs to continue her watch over Patty. Patty needs the help now to save Tess and we need to contribute and help. Any amount will help no matter how small. This is the cruel reality of loving and owning a pet these days. Many of us don’t have the funds available for emergencies like this. I know with my 12 year old German Shepherd, my credit cards were stretched to the limit as I struggled to keep him going and not in pain. Prayers being sent, I hope they are able to get the surgery done and Tessa can continue being her Mom’s guardian angel. God bless you, Sweet Tessa and family. I am praying hard for you. Be sure to try GoFundMe for more donations.